Elleanor on the street in Harajuku wearing a yellow leather motorcycle jacket over a striped top, a belted denim skirt, patent buckle shoes, and a small plaid purse. Pastel-haired Harajuku girl in cutout black hoodie, red vinyl pants, Vans sneakers, and an MYOB backpack. 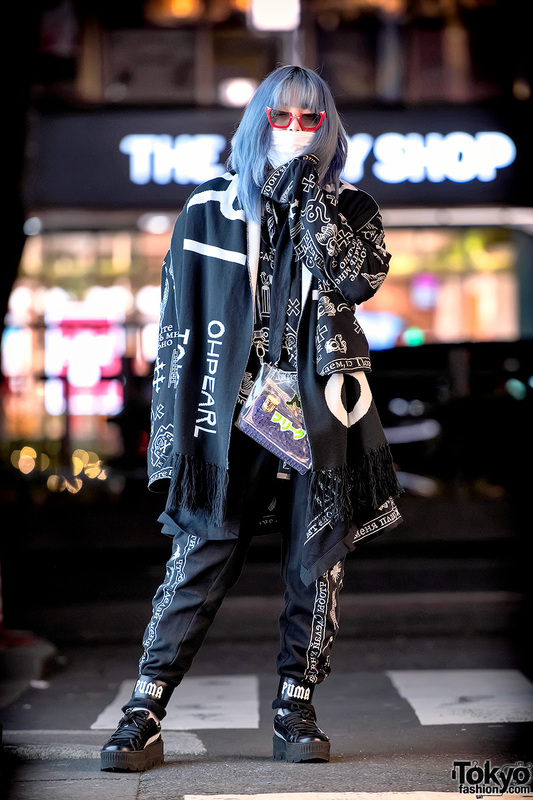 Harajuku fashion icon Shoushi wearing a monochrome street style featuring items from Freak City, KTZ, Fenty Puma, Miu Miu, and Oh Pearl Harajuku. Harajuku girls sporting colorful hairstyles and kawaii fashion with plaid dress over ribbed top, lace up boots & leather sling bag; checkered shirt dress & red sneakers; printed shirt, red pants & platform sandals; t-shirt, denim shorts & platform shoes. Tokyo street style featuring a faux fur coat over a lingerie top, vintage plaid shorts, Mary Janes, and a leather purse. Harajuku trio wearing mixed styles with all black outfit and dress shoes, a kimono dress over lace top and platform boots ensemble, and a floral print jacket with blouse, plaid skirt and loafers look. Harajuku girl showcasing an ultra-feminine street style in Harajuku.